Vicki Sue… Vicki who?? 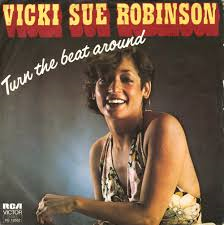 For some music fans, the name of Vicki Sue Robinson conjures up some very happy memories of the exuberant late 1970s. To a lot of other people, she is virtually unknown. Despite a fairly long career in show business, her time at the top and in the spotlight was all too brief. She released 4 wonderful albums, and a handful of singles before her career was abruptly cut short…. On May 31 this year, Vicki Sue should have celebrated her 60th birthday (if there was any justice in the world! ), but we lost her due to cancer in 2000, when she died a few weeks before her 46th birthday. Vicki Sue was a singer who was hard to classify – and maybe she was too versatile for her own good? She is remembered as one of the “Disco Queens” of the late 1970’s – yet her one Grammy Award nomination in 1976 was in the “Best Female Pop Singer” category. She was also labeled as a soul singer at times. Fair skinned, born by a black father and a caucasian mother, she was also sometimes referred to as black, but just as often she was considered white… What is most important is that she made some truly wonderful music, and her four albums (made 1976-79) are proof positive of her talent. It also proves that her music is almost in a category all its own; a great mix of disco, pop, soul and rock all melded into something truly new and creative. When her four original albums were re-issued on CD (with bonus tracks!) in 2011, I immediately bough them all, they really are treasures to be saved! All the albums have a style that is uniquely Vicki Sue’s own – and they display some of the very best dance music ever made! In a short while, I will discuss those albums in depth – and hopefully that will make all of you want to go out and buy them – these records are so good, you cannot live without! Stay tuned – for more about Vicki Sue Robinson in a little while. It’s about time we got this great artist back into the spotlight, and into our lives!